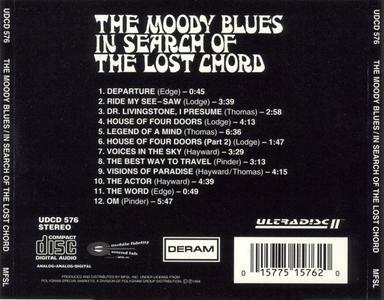 In Search of the Lost Chord, released in 1968, was The Moody Blues' third album. It has twelve tracks, with a total running time of 42:07. The album was published by Deram Records. Moody Blues: Justin Hayward (vocals, acoustic & electric guitars, 12-string guitar, sitar, harpsichord, piano, Mellotron, bass, percussion, tablas); Mike Pinder (acoustic guitar, cello, autoharp, harpsichord, Mellotron, piano, bass); John Lodge (acoustic guitar, cello, bass, tambourine, snare drum, background vocals); Ray Thomas (C flute, alto flute, soprano saxophone, background vocals); Graeme Edge (piano, drums, timpani, tambourine, tablas). Originally released on Deram (711). Includes liner notes by John Reed. After helping lay the groundwork for concept albums and progressive rock with 1967's orchestra-enhanced suite DAYS OF FUTURE PASSED, the Moodies retrenched for the follow-up. They abandoned the orchestra but kept their sound as rich as before by playing a multitude of instruments themselves, including everything from sitar to cello to oboe. At the time, it was remarkable enough for these instruments to appear on a rock record, much less to be played by the band itself. The string-laden conceptual pieces of DAYS were replaced by shorter, more concise songs that leaned more toward Beatlesque pop and displayed a pronounced Eastern influence. Graham Edge's short spoken-word pieces provide a properly arty framework for the Moodies' blend of swooping mellotron, haunting flute, and rich, multi-tracked harmonies. The slightly Hollies-ish "Ride my Seesaw," one of the band's strongest rockers, is a highlight. Flutist/vocalist Ray Thomas provides the quirky Britishness so essential to '60s UK pop-rock with his music-hall-on-acid number "Dr. Livingstone I Presume." The soaring harmonies of "Legend of a Mind" work in praise of Timothy Leary and his "trips to astral planes." IN SEARCH OF THE LOST CHORD is the most exotic, trippy album in the Moodies' catalog. The album is considered by some to be a concept album because several of the tracks deal with the theme of a person's search for spiritual fulfillment. Another concept dealt with in the album is the search for a mythical "lost chord," which is revealed to be the mantra "Om" (in the last stanza of Graeme Edge's poem "The Word"). After using the London Festival Orchestra on Days of Future Passed, the Moody Blues played all instruments themselves - approximately 33 - on In Search of the Lost Chord. Indian instruments such as the sitar (played by guitarist Justin Hayward) and the tamboura (played by Pinder) made audio appearances on several tracks (notably "Departure," "Visions of Paradise," and "Om"). Other unconventional (for the Moody Blues) instruments were also used, notably the oboe (played by percussionist/flute player Ray Thomas) and the cello (played by bassist John Lodge, who tuned it as a bass guitar). And the mellotron, played by Mike Pinder, produced many string and horn embellishments. Having already experimented with spoken word interludes on "Morning Glory" and "Late Lament" on Days of Future Passed, the Moody Blues tried the practice again on In Search of the Lost Chord, on the Graeme Edge-penned pieces "Departure" and "The Word." Both pieces were recited by Pinder, who was the primary reciter of Edge's poems on this and other Moody Blues albums. The first song of this CD, "Departure," let's you know to please take your seat, buckle up, and enjoy the ride, not at 30,000 feet above the mind, but shooting up through the void of outer space. As it delivers us into the Sun "without burning a wing …" we are delivered to the next serving in this multi-course dinner of music, revelations, songs, and insights. The CD cover is the first clue as to what this CD is about - birth, death, and rising to enlightenment. "Departure" also is the signal to us that the Moody's are beyond their previous album, "Days Of future passed," and are creating music mainly for themselves. The success of "Days" allows them their indulgence, sans the London orchestra. In Search Of The Lost Chord, the title reveals that not only are they looking for the ultimate note, but that chord is there, if you just get beyond the expectations and dictates of society, the government and the industries, including the music industry. Pink Floyd had a similar revelation when they rebelled in "The Wall." 1968 - The year of Nixon, rebellion, a nation gone mad, a senseless war thousands of miles away, that prompted an entire generation a cry for peace, and music; music like no other period in the history of mankind. It is an age of experimentation, of angry youths singing outrage at the military-industrial complex. And then, after all was said and done, a British rock group created an album which in many respects outdid their previous albums. The Moody Blues decided that the technology of the day allowed them to emulate an entire orchestra, so they experimented with a combination of regular instruments, such as the oboe and french horn, but also with synthesizers, successfully mixing them into a CD that was influenced by not only the Beatles, but also eastern meditation, and mind-altering drugs via "Legend Of A Mind." Right after their tribute to Timothy Leary, they begin the second part of "House Of Four Doors," as if to say that the answer to their search may be in what the hippy guru, Dr. Leary proclaimed - "Turn on, tune in, drop out." Each door the singers encounters is a new universe to explore. "Voices In The Sky" implores nature to give up it's secrets, as if the singer awoke one day and realized that the world of his reality is no reality at all, just an illusion, which it is, according to eastern philosophy. The world of time, cars, 6 o'clock news and TV dinners eaten while watching the latest sitcom fades into the background as the singer cries out to the voices in the sky, the song of the Universe. If the Moody Blues were to play in the woods and no one were there to hear them, would they truly make us hear their sound? Just wondering. Thus, we come to "The Best Way To Travel" … Which is to say, we must use our minds, our imagination, our thirst for knowledge. The secret to the soul of any society is it's imagination, and the Moody Blues tell us so in this song, which then fades into "Visions Of Paradise" which tells us there is a better calling for us than we presume in our daily lives. It is calling to us to go to the garden paradise … "come see." And then, "The Word" booms out in the spoken word, telling us this garden universe vibrates complete, and we search for that chord, which is nameless, and as we search we name the chord which becomes "Om." The butterfly gracefully flies along the flowers as the earth turns slowly round.